(TibetanReview.net, Jan12’16) – China is coming under growing pressure from the public in Hong Kong as well as others for the release of five employees and owners of a book publishing firm who are widely suspected to have been kidnapped by mainland Chinese authorities. 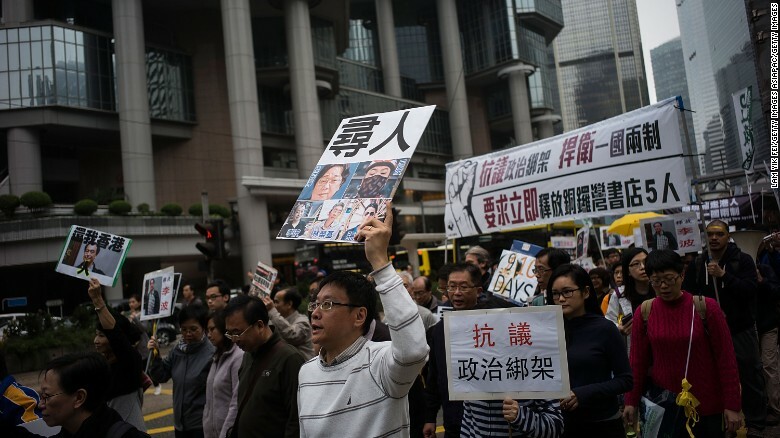 On Jan 10, thousands of people marched through central Hong Kong, demanding the release of five missing booksellers, reported straitstimes.com and others over Jan 10-11. The missing booksellers belong to Hong Kong’s Mighty Current publishing house known for bringing out books critical of top Chinese leaders and on Chinese politics. The firm was said to be about to publish a book on Chinese President Xi Jinping when its owners and employees began disappearing. The latest to vanish was Mr Lee Bo, 65, last seen in Hong Kong on Dec 30. Three others earlier went missing in southern China and one in Thailand since Oct 2015. They included a Swedish and a British passport holder. Lee, a British citizen, was reported to have sent a new letter and a video message to his wife saying he had gone to the mainland of his own accord and asking people to not join a planned protest over the case. This was in addition to the letter Lee was purported to have written earlier to his wife, saying he was “assisting” an unspecified police investigation across the border in Shenzhen by travelling there voluntarily. But this remained doubtful given the fact that his mainland travel permit, which Hong Kong residents must produce when crossing the border into mainland China, was reported to be still at home. Pro-democracy lawmakers, activists and some residents are said to believe that Mr Lee was kidnapped in Hong Kong by the mainland authorities. They accuse China of trampling on the “one country, two systems” principle under which Hong Kong has been governed since its return by Britain in 1997. “We demand the Chinese government immediately explain the situation of the five and release them,” Mr Richard Tsoi, an organiser of the march, was quoted as having told protesters through loudspeakers before the rally. Also, CNN Wire quoted protesters as having chanted “no to cross-border abductions” and “stop political kidnapping” at the march, which went from the Special Administrative Region’s government offices in the business district of Admiralty to the Chinese government’s liaison office in the western Hong Kong district of Sai Wan. The liaison office is the de facto headquarters of the People’s Republic of China in the city. Organisers have said 6,000 people took part in the rally. Meanwhile, the US State Department has said Jan 8 it was “disturbed” by the reports of disappearances, while the European Union has described the lack of information as “extremely worrying”. China does not recognize dual citizenship and say Chinese nationals, including those in Hong Kong, are Chinese “first”.